Plan Your Perfect Spain Itinerary with These Detailed Templates! Want to explore Spain but confused about the perfect itinerary? You are not alone! It can be a true challenge determining how many days to spend exploring. From 5 day Spain itineraries to 7 or 10 days, to 14-day itineraries – there are certainly lots of different routes and options to choose from. The hard part? None of the routes are necessarily bad or wrong since there’s just so much to see and do all around Spain! Compared to some other countries we have recently visited (such as Montenegro), Spain is a country that most people are familiar with – or have at least heard the name before. In 2017, Spain was the second most visited country in the world (you can read the full article here). Because of its popularity, Spain knowledge is really flowing around the travel world these days! It’s no secret that Lisa lived in Spain and took full advantage of her location (and her Spanish language knowledge)! So, she’s experienced quite a few of the places we recommend below for a great stop on your itinerary! If you are planning your visit to Spain, check out our other posts on travelling, working, and studying in Spain! Before you dive into Spain trip planning, you’ll want to consider a few details. 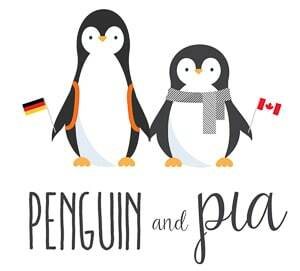 From the currency they use (the Euro) to the weather, public transport, and the best time to visit, we cover a few key areas below to help you prepare. Spain is a destination that can be visited year round – you just have to set your expectations right. Lisa visited Malaga with a friend in December and it was quite warm but of course not warm enough to go swimming. Since the country is quite big and has a diverse geography, there are actually a lot of different climate zones in Spain. Generally, the summers are hot and dry while the winters are mild and quite rainy. The average maximum temperature for July and August is 30 °C and 17/16 °C in December and January. However, this can vary greatly depending on which city you are visiting (e.g. Granada is always a little bit colder). We would recommend that you avoid the south – especially Sevilla – and Madrid in July and August since it can get VERY hot. And according to Lisa’s Spanish teacher in Bilbao, it would probably also be a good idea to avoid visiting the Basque country during the winter months since it can rain a lot. In our opinion, the perfect months for visiting Spain would be from March to June and September to the end of October. Spain has a very well developed long-distance bus system. Lisa was especially impressed by that since in Germany long distance buses didn’t exist until a few years ago and sometimes it can still be a bit chaotic or unclear. In Spain, almost every major city has an actual bus station (and not just a signpost). One of the biggest bus companies in Spain is Alsa. Lisa has used them quite a few times when living in Spain (to go from Madrid to Bilbao for example) and always had a pleasant experience. In addition to buses, Spain also has a pretty good rail system. You can check the train connections and prices on the RENFE website here. We would recommend that you always check both buses and trains as sometimes they take approximately the same amount of time and the bus can be significantly cheaper. In a few areas (such as parts of the Basque country), the buses can be actually a lot faster than the train. You can reach all of the places mentioned in these Spain itineraries with public transport. So if you don’t feel comfortable with renting a car in a foreign country you can still follow all of these itineraries. The bus and train stations are often very centrally located so it shouldn’t be a hassle to get into the centre in any of the cities. If you would like to rent a car and make these itineraries a road trip that is a great option, too. Driving in Spain is generally pretty safe – but it can get a little crazy in bigger cities like Barcelona or Madrid. Spaniards also like to speed – but if you are a confident yet careful driver then this shouldn’t be an issue. Since Spain is such a popular destination, there are lots of different rental car agencies available. You can compare prices from different agencies for the duration of your trip with this handy comparison tool. Make sure to read the fine print about additional costs in case there are any issues. In Spain, there are quite a few toll roads which start with an ‘AP’ in the name. If you want to avoid paying tolls you can often find a road that runs in a similar direction. Generally, your driving time will be longer if you avoid toll roads but you never know which hidden gems you come across on your way. When visiting Spain you – and especially when renting a car – you should get travel insurance. While you’ll probably be fine, accidents do happen (and Spaniards are more reckless drivers that in other countries) and they can be expensive. That’s why we always travel with insurance. If you live in a European country and have a European health insurance, you can get the blue EU Health insurance card with which you are covered in emergencies. If you don’t have that option, we recommend that you get private travel insurance. Eric has used World Nomads multiple times for that in the past. You can check how much you’d pay to be covered for your Spain trip here. If you plan on travelling through Spain for only 5 days, it’d be best to fly into one of the bigger cities as they are usually well connected with other European cities. Depending on your route, you can either take public transport if the travel times align with your plans or opt for a rental car if you would like more flexibility. As with the other Spain itineraries in this blog post, our 5-day itineraries are pretty fast-paced. However, since it is pretty much impossible to go top to bottom and actually see parts of the country we decided to write two separate Spain itineraries for 5 days. One covers the north and northeast of Spain while the other itinerary covers the south of the country. Choose the one that is more suitable for your interest and travel plans and feel free to modify the written itineraries however you see fit! For this classic 5 day trip across the northern parts of Spain, the total driving time is about 8 hours and covers around 750km. If you rent a car, given this exact route, there are tolls on most of the highways so keep that in mind that it may be longer if you took non-tolled roads that may be more indirect. A bus would be able to breeze right along these highways, however. Enjoy the waterfront in Barcelona with a stroll along it! Barcelona is a good city to start a road trip since it is a popular tourist destination and thus has frequent flights to other European or International cities. Barcelona is the capital city of Catalonia which has its own unique culture and language next to Spanish. Since it is such a popular city, the car rental industry is very well developed and it is easy to pick up a rental car from the airport or in the city. You can find your rental car here. Alternatively, the bus station in Barcelona is great and easy to reach from the centre. There are numerous connections to Zaragoza which will be the next stop on your 5 day Spain itinerary. Accommodation in Barcelona: As a super popular tourist destination, there are lots of Barcelona hostels, or hotels and apartments available in Barcelona. A Barcelona hostel even made our list of favourite hostels across Europe. However, since it is so popular we strongly advise you to book in advance – especially during summer – as it can get very expensive otherwise. We’ve written a whole guide on some of the incredible places to visit in Barcelona if you are interested in seeing more! On the second day of your 5 days in Spain you’ll spend the morning in Barcelona (you’ll get a cafe con leche y croissant in any cafe/bar for quite cheap if you get off the main tourist roads) and then drive from Barcelona to Zaragoza later in the day. The drive from Barcelona to Zaragoza will take you approximately 3 hrs 10 min by car (includes a toll road), 3,5 hrs by bus and 1,5 hrs by train. If you end up taking the train, try to book in advance if you can as this will usually end up being cheaper. Accommodation in Zaragoza: Since Zaragoza is a smaller city, there a not a lot of hostels available – but the few that exist have good reviews. Alternatively, you can find an apartment or hotel for your stay here. On your third day, you will drive from Zaragoza to Logroño which is the capital of the autonomous region of La Rioja and known for its delicious wine. If you get the chance visit one of the wineries and do a wine tasting – please plan ahead if you’re travelling by car since drinking and driving is a big no-no! The drive will be a lot shorter than the day before. By car, it’ll take you approximately 1 hr 40 min and by bus the journey would be around 2 hrs if you get a direct bus. 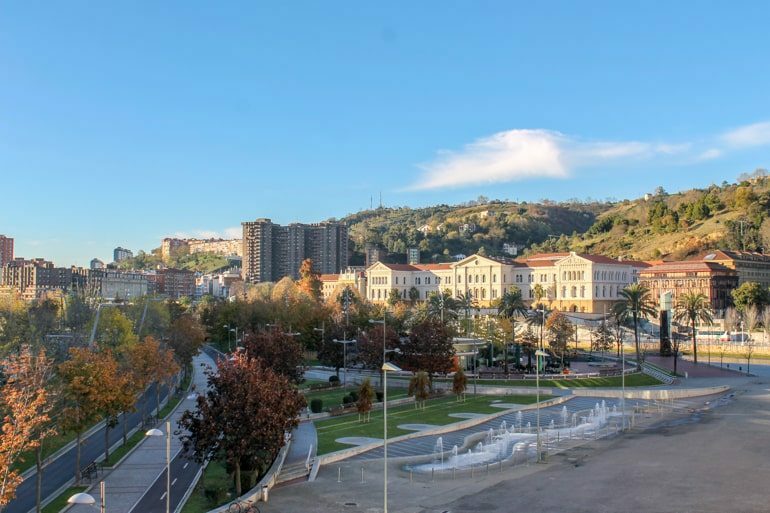 Accommodation in Logroño: Similarly to Zaragoza, Logroño is a smaller city and does not have a lot of hostels – but the hostels that exist are very good. If you prefer a hotel room, you can find one here. The waterfront in San Sebastian is absolutely gorgeous! Some would consider San Sebastián one of the most beautiful towns in Spain and Lisa can see why. When she lived in Bilbao she visited San Sebastián quite a few times and really enjoyed the vibe of the town (and having a beautiful beach so close). Don’t forget to eat some delicious Pintxos since San Sebastián is especially known for them! The drive from Logroño to San Sebastián takes around 2 hrs by car, between 2 and 5 hrs by public transport. Since you are travelling between two smaller cities the connections are not that great and we would recommend planning ahead to compensate for this. Accommodation in San Sebastián: San Sebastián is one of the most expensive towns in Spain and popular among luxury travellers. As such, hotels can be quite expensive. However, you can sometimes find great deals and save money when booking in advance. 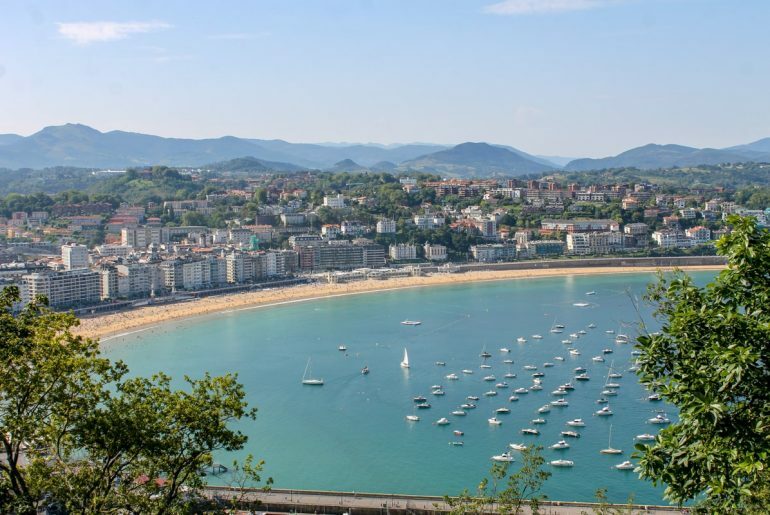 Look for current deals in San Sebastián here. The Guggenheim Museum never disappoints! Bilbao has to be one of Lisa’s favourite Spanish cities. Not because it is especially beautiful, but because she lived there for a few months and it felt like home from the beginning. If you get the chance, take the metro to one of the beaches – you won’t regret it! The drive from San Sebastián to Bilbao is a short and beautiful one as you will drive through some mountainous regions. By car it’ll take you approximately 1 hr 15 min and by bus the journey will be around 1,5 hours. Bilbao also marks the end of this 5 day Northern Spain itinerary. 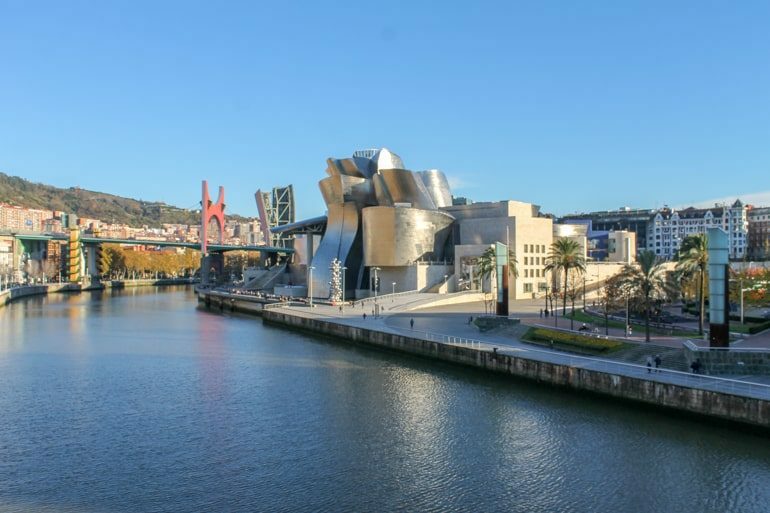 Bilbao is a good city to fly out of as it is one of the biggest cities in the region and well connected to bigger airports in other European cities. To get to the airport you can simply take the Airport bus from the bus station at San Mames. Accommodation in Bilbao: Since Bilbao is a bigger city there is a wider variety of accommodations available. As Mike and Sue of 197 Travel Stamps have written in our unique hostels in Europe post, they really like the Bcool Hostel in Bilbao. You’ll also be able to find lots of good hotels in the city. If you would like to explore Southern Spain instead of the north, then we would recommend the following 5 days Southern Spain itinerary. Generally, the south is a little bit warmer than the north so maybe don’t try to do this trip in the middle of the summer heat as it can be quite exhausting! The itinerary is just over 600 kilometres with a total driving time between 7 and 8 hours depending on your mode of transportation. 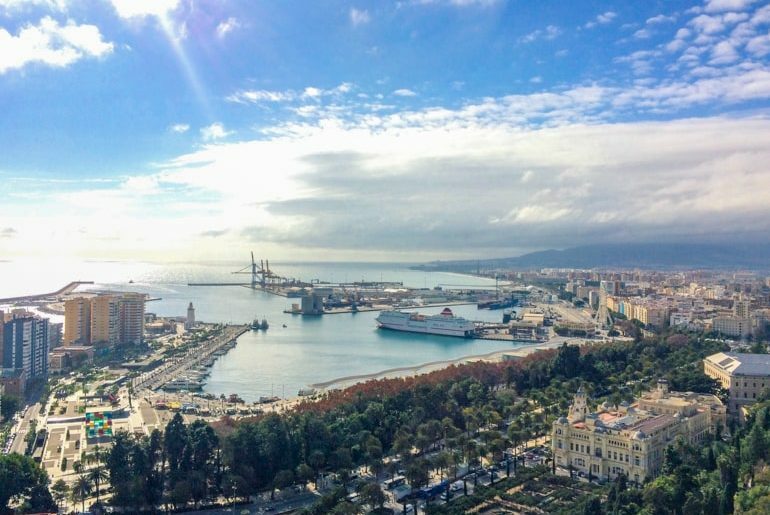 Explore Malaga and wave to the cruise ships that stop in. We are starting this itinerary in Málaga since it is an easy airport to fly in from other parts of Europe. When Lisa arrived at the airport the first time she was actually kind of shocked to see that all the signs were written in German as well. Needless to say, Málaga is a very popular destination among German tourists. It’s also an interesting city to visit in the wintertime! Lisa didn’t like the city that much (as in wouldn’t want to live there), but it is definitely worth exploring for a day or two. It is also quite easy to get from the airport to the city centre by public transport. Accommodation in Málaga: Malaga is a popular tourist destination and as such has a lot of different hotels and hostels. Lisa stayed at Casa Al Sur Terraza with her friend sharing a private room when they visited Málaga and loved it. You can find a great hotel for your stay in Malaga here. Remember, you’ll be sleeping at this place for 2 nights. Today you’ll take a day trip to Granada. If you decided to rent a car you can do this by car, but then have to find parking in Granada. Lisa and her friend took the bus to Granada which was pretty easy to do since there are frequent buses throughout the day. 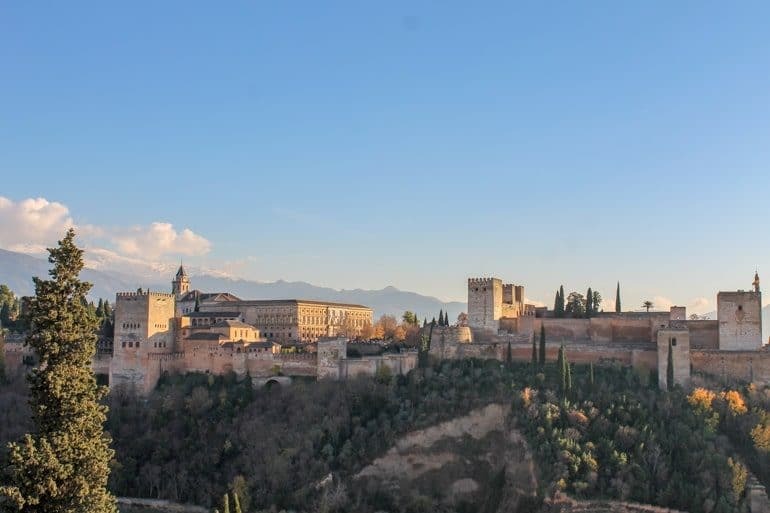 In Granada, you HAVE to go see La Alhambra. Make sure to book your ticket in advance (sincere there is only a limited amount of spots per day). Lisa and her friend had to pick up her tickets at an office in the city before going to the actual attraction. Double check your ticket since you might have to do that, too! The journey from Málaga to Granada is approximately 1,5 hrs by car and 2 hrs by bus. Accommodation in Granada: You won’t need a place to sleep in Granada since you’ll be returning to Málaga at the end of the day. On the third day of this 5 day Southern Spain itinerary you’ll drive from Málaga to Marbella. Marbella is a city by the water and part of the well know Costa del Sol. It is one of the most popular tourist cities in the region mainly due to its nice beaches and climate. Since Marbella is quite close to Málaga the drive won’t be long – giving you more time to explore the city and relax at the beaches. The journey takes approximately 1 hour by car (there are different routes some of which include toll roads) and 1.5 hours by bus. Accommodation in Marbella: Since the tourism industry is quite developed in Marbella there are lots of nice hotels to choose from. However, due to the kind of tourists visiting the area, there are not many hostels in Marbella. You can see a few on Hostelworld. Cádiz is often considered a hidden gem in Spain. Lots of people who have been there seem to love it and Lisa is dying to visit the city. Fun fact: Some think of Cádiz as the oldest continuously inhabited city in Western Europe. It is just slightly smaller than Marbella with lots of attractions waiting to be explored. Driving from Marbella to Cádiz by car will take you approximately 2 hours including a toll road and slightly longer if you want to avoid toll roads. You’ll drive along the coast for a while and could consider stopping along the way. Another option would be to make a pit stop in Gibraltar which you will pass along the way. Unfortunately, Marbella and Cádiz do not seem to be connected well by public transport and travelling between the two cities would involve going back to Málaga and/or through Sevilla (or Seville as the English like to call it). If it is too much of a hassle for you to get from Marbella to Cádiz, consider skipping it and going straight to Seville instead. Accommodation in Cádiz: Even though Cádiz is a smaller city it does have quite a few hostels with amazing ratings – you can check them out here. In addition, there is a good amount of hotels and apartments available in Cádiz as well. Seville is another popular destination in Spain and often considered one of the hottest cities of the country. Therefore we would not recommend going there during July and August if you don’t like extreme heat (Lisa definitely doesn’t). It is a beautiful city with lots of attractions to check out so be sure to have a good amount of time for exploring. If you don’t end up going to Cádiz, there is more than enough to do in Seville to keep you busy for two days! Driving from Cádiz to Seville will take you approximately 1.5 hours by car and just slightly longer (1 hr 45 min) by bus. Sevilla also marks the end of this Southern Spain trip as it has a big airport which makes it super easy for you to fly back home. Accommodation in Seville: As we have mentioned, Seville is a bigger and very popular city so there is no shortage of great hostels and hotels. Since it is so popular we would advise booking ahead – especially during the high season. You can check here for hotels in Seville and for hostels in Seville. If you have slightly more time to explore Spain, we have also created two 7 day Spain itineraries for you. You’ll see that once again we give you two options since seven days are – in our opinion at least – still not enough to see the whole country. Therefore, you’ll find a 7 Day Western Spain Itinerary and a 7 Day Eastern Spain Itinerary below. As always, feel free to modify them to make them fit your exact plans! For this itinerary, the total driving time would be around 14 hours and the distance would be around 1300 km. These estimates account for the Toledo day trip (and back to Madrid) AND finishing with ONE of either Seville OR Malaga from Córdoba. So, in theory, it could be shorter or longer than we have indicated here on the map! The many sides of Bilbao – autumn leaves make for amazing strolls through the city. Similarly to how we ended the five-day itinerary in Bilbao, we’ll start this itinerary there as it is a relatively easy airport to fly into from other places in Europe. Make sure to use your time to explore the Casco Viejo (the Old Town) and walk along the river! There are some great Pintxo places in the Old Town that you should absolutely check out! Accommodation in Bilbao: As mentioned before, there are lots of hostels and hotel accommodations in Bilbao. Burgos is full of gorgeous sights and things to check out! 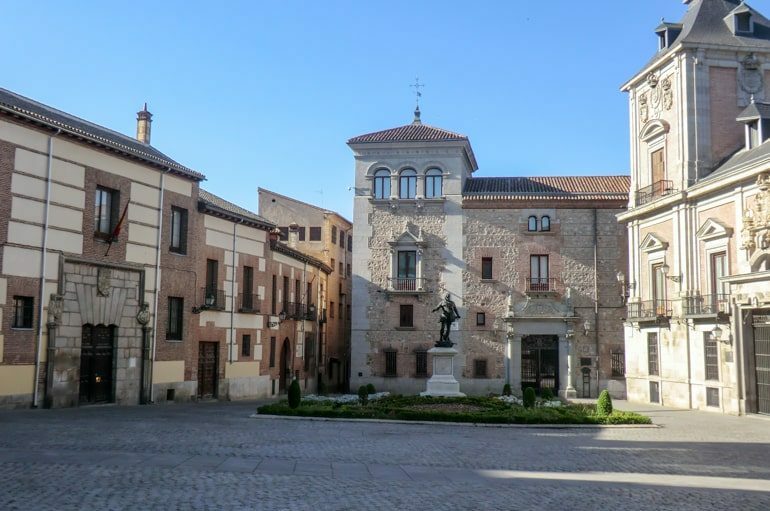 Burgos might not be a city that is immediately on your radar for places to visit in Spain but we would recommend a stop there on your way south. Lisa visited Burgos with friends on a day trip from Bilbao so she knows how easy it is to get there. Burgos is a nice city but since there is not a ton to see, one night is the perfect amount of time in our opinion. Getting from Bilbao to Burgos takes approximately 1.5 hours by car and 2 hours by bus. Accommodation in Burgos: Since Burgos is not an overly big city, there is a limited amount of hostels available. You can check them out here. There are, however, a few really good hotels in Burgos which can get booked out so be sure to book in advance if possible. 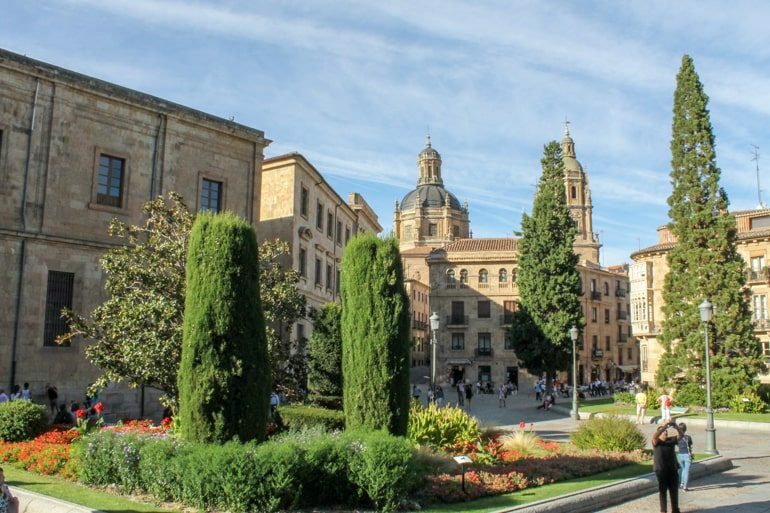 From Burgos, your journey continues to Salamanca – another one of Lisa’s favourite cities in Spain. Salamanca is sometimes called “The Golden City of Spain” and you’ll understand why. The many sandstone buildings get illuminated beautifully by the sun – making it appear golden. Be sure to bring your camera because you’ll want to use it in Salamanca. Our tip: Cross the river to get amazing photos of the cathedral. 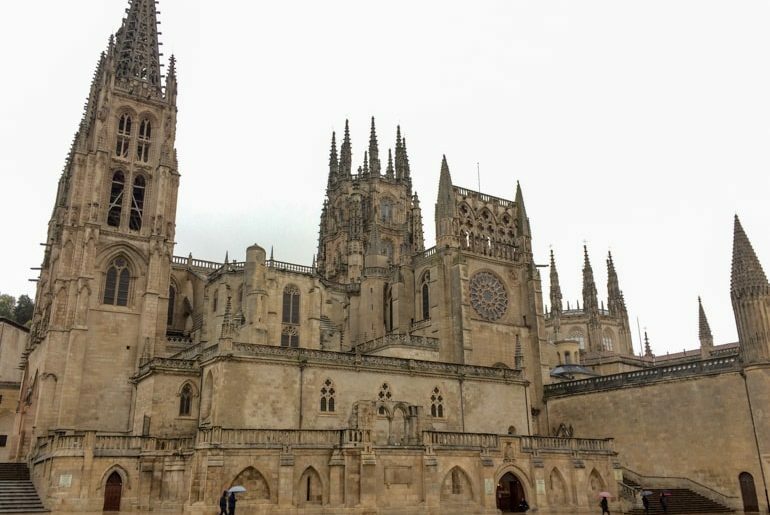 Getting from Burgos to Salamanca is easy and will take approximately 2.5 hours by car or 3 hours by bus. Accommodation in Salamanca: When Lisa visited Spain on a weekend trip with friends they stayed in a hostel very close to the Old Town. Salamanca has a good selection of hostels which you can see here. If you prefer to stay in a hotel, you can find some nice ones here. 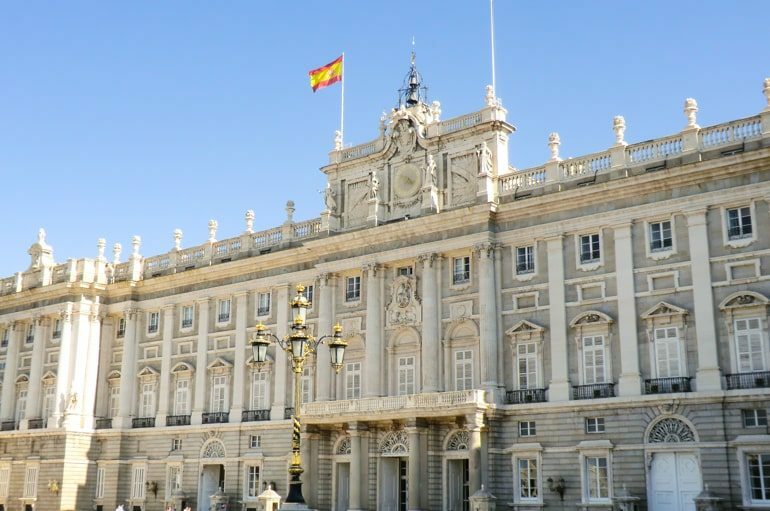 The Royal Palace of Madrid draws in LOTS of visitors year after year! Since Madrid is the capital of Spain you shouldn’t miss it on your itinerary. Conveniently it is also quite close and easy to get to from Salamanca. Since there is so much to see in Madrid one day to explore might not be enough for you. That’s why you might opt for spending two days in Madrid instead. Lisa has been to Madrid two times now and still hasn’t seen everything there is to see. But at least you’ll get a good sampler! As mentioned, getting from Salamanca to Madrid is easy. The journey will take approximately 2 hrs 12 min by car (including a toll road) and 3 hours by bus. Madrid’s main bus station is actually underground which is kind of cool and caused a lot of confusion for Lisa and her friends when they tried to find it the first time. Accommodation in Madrid: The two times Lisa has been to Madrid she has actually stayed at the same place – it is called Hostal Madrid. The name can be misleading since it is not actually a dorm style hostel – they have a lot of private rooms/mini apartments super close to Puerta del Sol for a very reasonable price. Definitely recommend! Alternatively, you can find a suitable Madrid hotel for you here. Also notice that you’ll be staying at this place for two nights. For more recommendations read our guide about amazing things to do in Madrid. As mentioned, you might opt to spend another day in Madrid since there is so much to see. If that’s the case read our Madrid guide linked to above to get more recommendations. Alternatively, you could opt to go on a day trip to Toledo, a beautiful small city not too far from Madrid. If you don’t want to drive there yourself, you can choose to join an organized day tour which includes a tour of Toledo among other things. If you want to drive yourself the journey will take you approximately 1 hour by car and the same amount of time by bus. The next day you will drive to Córdoba, a city in Andalusia known for its famous flower street – among other things of course. There is a lot of history to be found in Córdoba so consider taking a walking tour if you want to learn more about it. This is one of few routes where you will actually be faster taking public transport as if you were to drive yourself since there is a good train connection between Madrid and Córdoba. Driving by car takes approximately 4 hours while the journey by train would be slightly shorter with 2 hrs 15 min. Accommodation in Córdoba: There are quite a few hostels with very good ratings in Córdoba so you’ll be sure to find a hostel to stay that fits your needs. Check them out here. If you prefer a hotel you’ll also have a lot of options to choose from. There’s a good chance you’ll find a great hotel deal in Córdoba. For this itinerary, you can decide in which city you would like to end your trip. For some, it might be more convenient to fly out of Seville while for others Málaga might be the better option. So it’s really up to you and your preference! The journey from Córdoba to Seville takes approximately 1 hr 40 min by car and 45 min by train. The time it takes to get from Córdoba to Málaga isn’t much longer with 1 hr 50 min by car and 50 min by train. Accommodation in Seville or Málaga: Since we have talked about both cities before we’ll just give you the accommodation links again: hotels in Malaga and hostels in Malaga and hotels in Seville and hostels in Seville. But cities have a good selection of hostels, hotels and apartments so you’ll surely find something that works for you. If the other 7 day Spain itinerary doesn’t really appeal to you and you would like to stay closer to the coast, maybe this itinerary is more to your liking. The driving time would be just shy of 11 hours and would be approximately 1000 km driving distance! 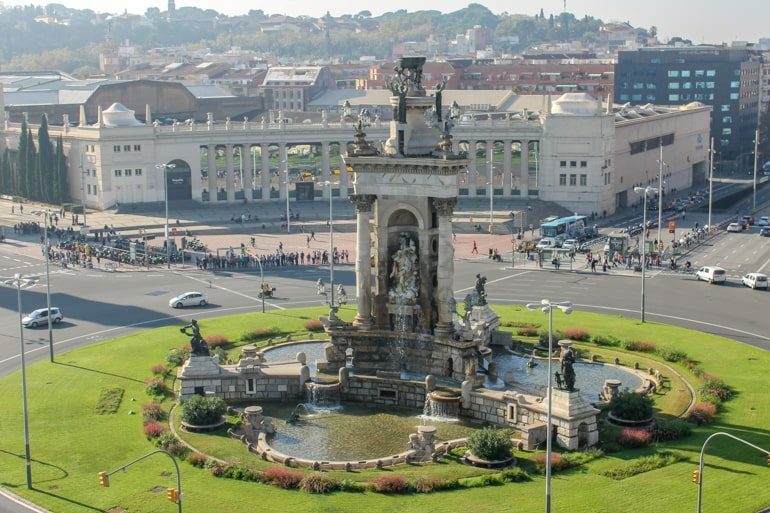 Barcelona has beauty around basically every corner – or roundabout! Once again, this itinerary starts in Barcelona since it is one of the easiest airports to fly into. Since you have a little bit more time with this itinerary you’ll stay in Barcelona for two days. There is lots to see so you still won’t see everything, but definitely more than in just one day. Accommodation in Barcelona: As mentioned above, there are a lot of hostels and hotels in Barcelona. Since it’s so popular the good places get booked up way ahead of time. So book your place early! And remember, you’ll be staying at this place for two nights. The third day of this Spain itinerary will take you from Barcelona to Valencia which is another city on Lisa’s favourite list. It was actually the first Spanish city she visited and she fell in love with the city and its people right away. Her favourite part is that there is a huge part in what was formerly a river that stretches through a big part of the city. In order to get from Barcelona to Valencia, you’ll drive along the coast for 3.5 hours by car and around 3 hrs 15 min by train. Accommodation in Valencia: Since Valencia is a bigger city, there are lots of hostels and hotels available in Valencia. When Lisa lived there she stayed in the district of Benimaclet but there are also many options in the heart of the centre. Alicante is a popular holiday town that lots of Europeans visit to enjoy the nice weather and the beaches. Maybe you have heard of the name Costa Blanca? Alicante is part of that exact region. When you’re there don’t forget to check out some of the nice beaches – but of course, there are also lots of other things waiting to be explored. Getting from Valencia to Alicante won’t take overly long. The drive will take approximately 2 hours by car and 1.5 hrs to 2.5 hours by train or bus respectively. 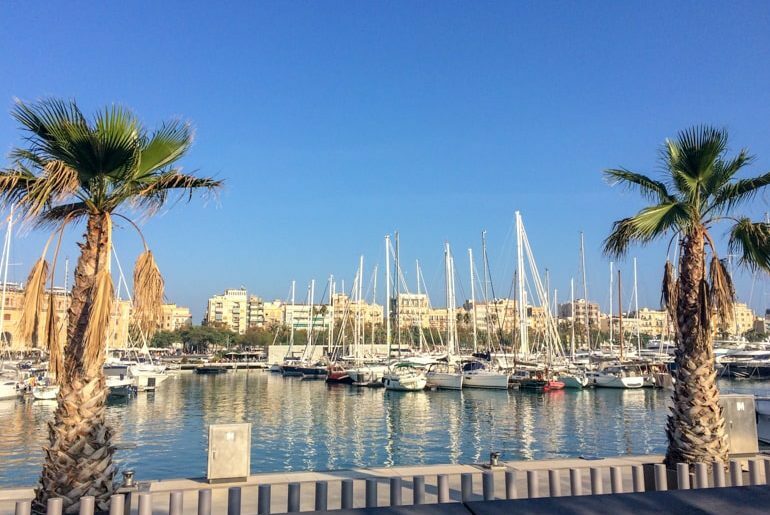 Accommodation in Alicante: Alicante has a good mix of great hostels and hotels available so you’ll be sure to find a place that works for you. Don’t forget to book ahead in the summer time since it can get very crowded. Murcia is a city in the southeast of Spain and the capital of the region with the same name. Travellers who don’t know much about Spain (yet) might not have heard of the city before but this doesn’t mean it is not worth a visit. The drive from Alicante to Murcia is quite short with 1 hr by car and 1 hr 10 min by bus. This will give you a good amount of time to explore the university city and get a rest from all the driving. Accommodation in Murcia: Since Murcia is a less touristy city there are not a lot of hostels available. However, you’ll find a good amount of hotels in the city which you can check out here. Exploring Granada from above allows for amaing views! From Murcia your journey will continue to Granada, a city which we have mentioned quite a few times by now so we won’t go into details again. If you haven’t yet, make sure to get your Alhambra tickets in advance! Driving from Murcia to Granada will be a slightly longer trip with 2 hrs 45 min by car and around 3.5 hrs by bus. 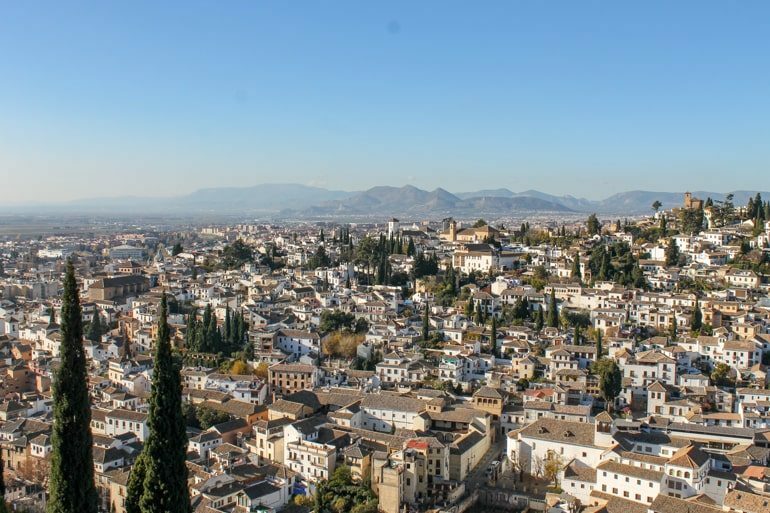 Accommodation in Granada: Since Granada is a popular travel destination there are lots of hostels available – many of them with amazing reviews. You can check them out here. If you’re looking for a hotel instead you can find one on this page. Since we have mentioned Málaga countless times above, there is not much to add. As you probably know by now Málaga has a great airport to fly out of so this is where this 7 day Eastern Spain itinerary ends. The journey from Granada to Málaga is approximately 1,5 hrs by car and 2 hrs by bus. Accommodation in Málaga: If you are still looking for accommodations in Málaga, here is the link to finding a hotel in Málaga. And if you are looking for a hostel instead, check out this hostel page. This road trip would be a beast. As planned above with the scheduled day trips you’d cover around 2600 kilometres. The driving time would be around 27 hours and 30 minutes– but of course, this varies by traffic and which day trips/stop days (beach days) you opt to take, etc. If you swung down to Gibraltar at the end and then went to Granada and Malaga, it could very well be a tad longer. You should also consider the price of renting a car for two weeks to see if there are any companies that offer discounts! Since you have read about most of these places in some of the itineraries above we’ll keep this one short. Once again we are starting this itinerary in Bilbao since it is an easy city to get to. There are quite a few things to see and delicious foods to try so with this itinerary you have slightly more time to explore the city! Accommodation in Bilbao: Once again, you can find a suitable hotel here or check out the available hostels here. You’ll spend two nights at your chosen accommodation! Wander the streets of Vitoria-Gasteiz. You won’t regret the stop. 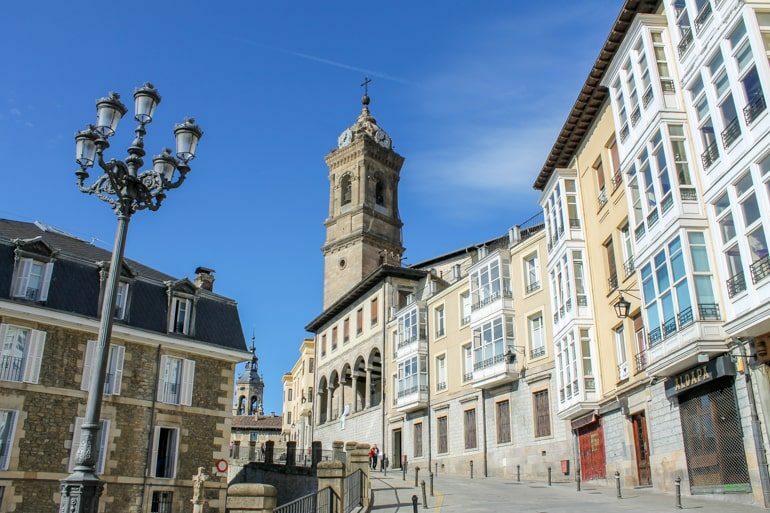 To give you the chance to see a bit more of the region we recommend a day trip to either Santander or Vitoria-Gasteiz, the capital of the Basque Country. Alternatively, you can also opt to spend the day at the beach if the weather is nice (more on that below!) or use the time to see more of Bilbao. Getting to Santander from Bilbao takes approximately 1 hr 15 min by car and 1.5 hrs by bus. The journey to Vitoria-Gasteiz is slightly shorter, taking approximately 1 hr by car and the same amount of time by bus. If you opt for a beach day instead, we would recommend Sopelana beach. It is easy to reach with the metro. Just take line no 1 in the direction of Plentzia and get off at the Sopelana stop. From there you can either walk or take the bus to the beach. It’s Lisa’s favourite beach in the Bilbao area since it looks beautiful and is not too crowded. It’s also a great stop to try some surfing. The next stop on your 14 day Spain itinerary is San Sebastián – a city we have already mentioned before. Beautiful beaches and delicious pintxos await you! The drive from Bilbao to San Sebastián takes around 1 hr 15 min by car and 1.5 hrs by bus. There are very frequent buses by lots of different operators between these two cities. Accommodation in San Sebastián: As mentioned, San Sebastián is an expensive city but you can check for current deals in San Sebastián here. Day 5 of this itinerary will take you to Zaragoza, a city mentioned in the 5 day Northern Spain itinerary. The drive will be a bit longer but you’ll still have enough time to check out some of the attractions Zaragoza has to offer. Driving from San Sebastián to Zaragoza will take approximately 2 hrs 45 min by car (including a toll road) and around 4 hrs by bus. Accommodation in Zaragoza: Once again you can check for hostels in Zaragoza here and hotels or apartments here. A tour across the country wouldn’t be complete without including Barcelona. Since there is so much to see you’ll be spending two nights in the city to give you enough time. The drive from Zaragoza to Barcelona will take you approximately 3 hrs 10 min by car (includes a toll road), 3.5 hrs by bus and 1.5 hrs by train. Accommodation in Barcelona: As mentioned there are lots of Barcelona hostels, or hotels and apartments available. Just remember to book ahead of time and that you’ll be staying here for two nights. And we’re back in one of Lisa’s favourite cities. The drive from Barcelona to Valencia will be a bit longer but it is worth it (in our opinion at least). Driving from Barcelona to Valencia will take around 3.5 hrs by car (including a toll road), 3 hrs by train and 4 hrs 15 min by bus. Accommodation in Valencia: You can see which hostels and hotels are available in Valencia during your travel time. As the capital city, Madrid is full of amazing sights and attractions. Of course, you can’t forget about the capital of the country when going on a trip through Spain. Since there is so much to see and do you will spend two nights in Madrid. This will also give you some time to recover from the long driving days you’ve had. Driving from Valencia to Madrid takes approximately 3.5 hrs by car and slightly less than 2 hrs by train. Accommodation in Madrid: As mentioned before we recommend Hostal Madrid. If it is booked out or not your style, you can find another Madrid hotel here. Remember that you’ll be staying at this place for two nights. Again, read our Madrid guide for more tips! For the next stop o your itinerary you can decide where you would like to stop. From Madrid you are driving further south and both Toledo and Córdoba would be great options for a stop on the way to Seville. The drive from Madrid to Toledo will be short and only take an hour by car or bus. The drive from Madrid to Córdoba is a lot longer and takes approximately 4 hrs by car and 2 hrs by train. While this drive would be longer, your drive the next day would be significantly shorter from Córdoba than from Toledo. Accommodation in Toledo or Córdoba: You can look for hotels in Toledo here and for hotels in Córdoba on this page. On day 11 you will drive from either Toledo or Córdoba to Seville – a city we have mentioned multiple times now because it is very much worth the visit. If you ended up staying in Toledo, it’ll take you 4.5 hrs by car and 4 hrs by train to get to Sevilla. If you stayed in Córdoba it’ll only take you 1.5 hrs by car and 45 min by train to get to Sevilla. Accommodation in Seville: As mentioned, Seville is a bigger city with lots of accommodation options. You can check here for hotels in Seville and for hostels in Seville. Remember, you’ll be staying for two nights. Since there is a lot to see and do in Seville, you have the option to stay another day to explore more of what the city has to offer. If you’d prefer to see a different place you can consider day trips to either Cádiz or Gibraltar. Know that Gibraltar is not officially part of Spain but belongs to the United Kingdom instead. It’ll take you around 1.5 hrs by car or train to get from Seville to Cádiz. To get from Seville to Gibraltar it’ll take between 2 and 3 hrs by car. There does not seem to be any public transport between Seville and Gibraltar since it is another country, but you can participate in an organized tour from Seville to Gibraltar. On your second to last day of this itinerary you will drive from Seville to Málaga, a route we have mentioned quite a few times by now. 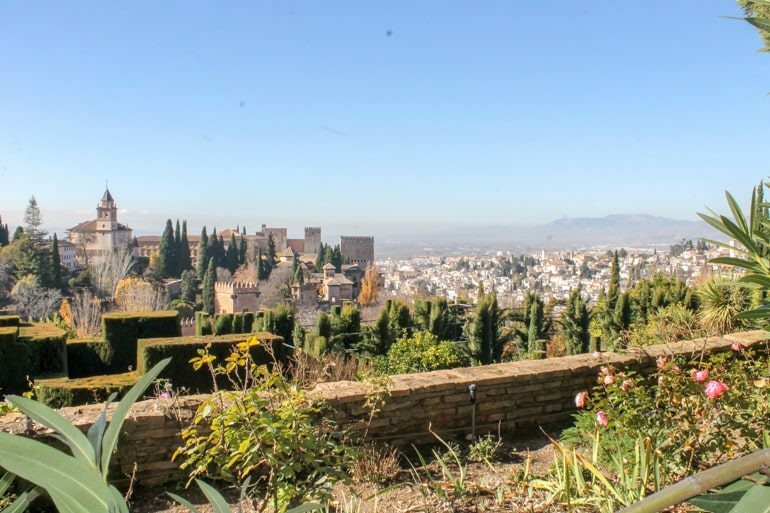 If you really wanted to visit Granada you could also drive there instead and then make the trip to Málaga at the end of the day or the next day. The journey from Seville to Málaga will be approximately 2.5 hrs by car and 2 hrs by train. Accommodation in Málaga or Granada: Once again, you can look for hotels in Málaga here and hotels in Granada here (if you decide to go there and stay overnight). And this is the end of your two weeks Spain itinerary. Once again Málaga is the city you fly out of since there are lots of great flight connections to other places in Europe. Alternatively, you could also stay in Seville and visit Málaga on a day trip if the airport in Seville works better for you. 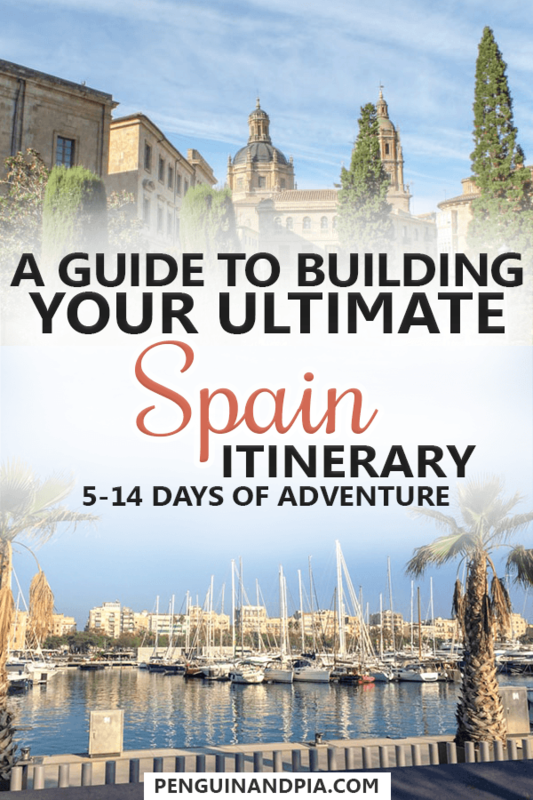 And there you have it – 5 epic itineraries around Spain! Whether you need 5 days or 14, we think you’ll have lots to work with to plan that perfect trip. Lisa is so happy to be able to provide you with her knowledge of the country. There is still so much to cover – but we think that these itineraries are a great starting point – you may even do the routes as is and see how they go! If you do travel Spain using our itineraries for inspiration, let us know @penguinandpia! We’d love to hear about your experience!